Does your high schooler freeze at just the idea of writing a college essay? It can be so hard to talk about ourselves, but in their college essays, students have to do just that. Unfortunately, these essays are an influential part of the overall college application. Writing an essay about “who you are” is easier said than done. Essays show colleges who the applicant is beyond their grades and test scores. Essays are often revealing and personal, so it’s understandable that so many students are nervous about writing them. 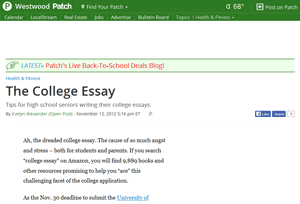 The Westwood/Century City Patch asked me to share my best tips about writing college essays with their readers. Find out everything you need to know about writing your best college essay, plus the ONE thing you must know before you start your essay. Ah, the dreaded college essay. The cause of so much angst and stress – both for students and parents. If you search “college essay” on Amazon, you will find 9,889 books and other resources promising to help you “ace” this challenging facet of the college application. As the Nov. 30 deadline to submit the University of California application looms just over three weeks from now, now is an excellent time for essay pointers.